From the late 1990s and in to the following decade, the World Wide Web was a bastion of free expression. The banner cry was “Content is king.” If entertaining or informative content was created it found an audience. The cost to produce, publish, and reach an audience online was within the reach of almost anyone. As a result, many mission-driven individuals and organizations launched a tremendous number of websites dedicated to a wide variety of subjects that were previously not covered by the mainstream media. Subjects that had the potential for broad appeal but were previously overlooked by gatekeepers at large corporations were suddenly getting attention and being published online by smaller entities with a better understanding of the audience. New search engines such as AltaVista, launched in 1995, and later Google, in 1998, provided fast but more importantly fair access to content based upon one’s search criteria. The ability to discover new or previously unknown websites was now possible with the new search engines. The mid- and late 1990s was an exciting time for the Web because so much new, rarely shared, or difficult-to-access information was now accessible. Today, there is more reason for concern, outrage even, than there is for excitement. The reasons are plentiful. One reason is the pimping of Wikipedia. Over the past few years, a curious trend evolved. Wikipedia began dominating search results on Google (the world’s most popular search engine). It is not that Wikipedia does not deserve to rank high on many queries, but Wikipedia’s 24 million articles rank in the top 3 on virtually any subject one might run a search. Today, Wikipedia is ranked sixth in the world based upon traffic as reported by Alexa, a Web information provider (See Note 1). In today’s world, a website’s traffic ranking is more a function of its ranking in a Google search result than for the quality of its content. Consider Google searches (Note 2) on the following terms Jewish, African-American, Medicine, and Quantum Physics. For all of my results, ignoring paid placement [advertisements], Wikipedia ranked first. In some cases, Wikipedia ranked first, second and third in the search results. The assumption here is that of all the tens of millions of webpages returned, in each query, Wikipedia is the best result. A smart person can argue about the validity in the relative ranking of Wikipedia, but the fact remains that Google’s dominance in search and its high ranking of Wikipedia is largely responsible for Wikipedia’s dominance on the Web. But that is just the beginning. We see on the upper-right-hand side of the Google search results page, Eric’s name, photograph and biographical information prominently displayed. The short bio is provided by Wikipedia and serves as a perfect segue to the list of several of Eric’s many novels. Click on any of the books and you will be presented with more Google pages where you may purchase Dickey’s eBooks from Google Play without ever leaving Google. Google is now intercepting visitors who they would have previously been sent to another website. Google also provides links to allow you to purchase the print version of Eric’s books from Amazon.com and BarnesandNoble.com. Presumably, commissions from these sales go to Google. Here, Wikipedia’s content is used to help present and sell Google eBooks. Google, incidentally, is the No. 1 most visited site. The 4th result is Amazon.com, the 9th most trafficked site in the world. If one followed the Amazon link, and clicked Eric’s biography on Amazon you will discover Eric Jerome Dickey’s “Shopping-Enabled” Wikipedia page on Amazon (see screen shot on right ). Eric Jerome Dickey’s “Shopping-Enabled” Wikipedia page contains all of the information from Eric Jerome Dickey’s Wikipedia page, but on Amazon all of his novels now hyperlinked directly to an Amazon page allowing you to immediately and easily purchase that particular novel. Admittedly, this really is a clever use of the content from Wikipedia. Somehow I doubt the people who volunteered to compile and enter the information on Wikipedia expected the information to be used to generate revenue for Amazon. Then again, those “volunteers” may have known exactly what they were doing. The ninth result is Dickey’s Facebook Fan Page. While on Facebook, you’ll also discover an Eric Jerome Dickey Page, which is his Wikipedia page copied and pasted directly into a page on Facebook. The Facebook page which was copied from Wikipedia, has almost 18 times as many Facebook “Likes” (159,119 Likes as of February 17th) than the Official Facebook Fan Fan page (8,979 Likes) that Eric Jerome Dickey created himself. Facebook is the No. 2 most visited website. Considering Wikipedia’s content is used throughout Facebook, Wikipedia obviously has a hand in Facebook’s remarkable global ranking and huge revenues. The third result for Eric Jerome Dickey is Wikipedia.org. As previously discussed, this is not surprising. However, given the fact that the Wikipedia page is merely a 400-word bio and a list of his published novels; one could easily make a reasonable argument many of the nearly 600,000 results returned in the Eric Jerome Dickey Google search should rank ahead of Wikipedia.org, based solely on the quality, depth and originality of the page’s content. The AALBC.com Eric Jerome Dickey page, which comes in at #6 (Note 3), also has a bio and a complete listing of all of Eric books. In today’s world, providing a list of books is trivial. There are countless websites that dynamically generate a list of an author’s book, with the images (already an improvement over the Wikipedia page for Eric). The AALBC.com page also points to critical, and original, reviews of five of Eric’s novels, hosts two original videos, as well as tons of curated and related content. The page has been updated continuously for more than 12 years. We’ve seen that Google contributes substantially to Wikipedia’s global ranking by returning Wikipedia very high in search results. We have also seen that Google uses Wikipedia’s content directly on their search results page to sell their eBooks. We’ve shown that, Amazon and Facebook are using Wikipedia content virtually unaltered; with Amazon monetizing the encyclopedia by providing visitors with links to buy anything on the page that is available for sale. We’ve also shown that content from Wikipedia, which was created by unpaid volunteers, is used by Amazon, Facebook, and Google for commercial purposes. All of these websites are on the very first page of the Google search results for this author, using Wikipedia’s content and profiting wildly as a result. The problem, unfortunately, is much more profound than the subjective rankings of different websites or the exploitation of Wikipedia for monetary gain. The biggest problem in this entire scenario is that the smaller websites who actually create much of the richness and uniqueness of the Web are increasingly crowded out by being buried so deep in the search results they are rendered invisible. The opinions, critical reviews, interviews, articles by independent sources are being outranked by corporate websites who are merely reusing the same Wikipedia sourced content. If we were to plow through the remaining search result pages, we would see many more links to Google. If you click on the image on the right you will see a search result page where half of the links are pointing to dynamically generated pages describing just one of Eric’s books. Amazon pages dominate the search results in the same manner. Is the Web searcher really better served seeing these redundant results from just a few large corporations? These types of results are out ranking Eric’s publisher’s website and the many independent websites that have reviewed Eric’s novels, or have posted interviews and articles about him. One could avoid this problem by using another search engine, but the vast majority of those who perform internet searches prefer Google (Note 4). 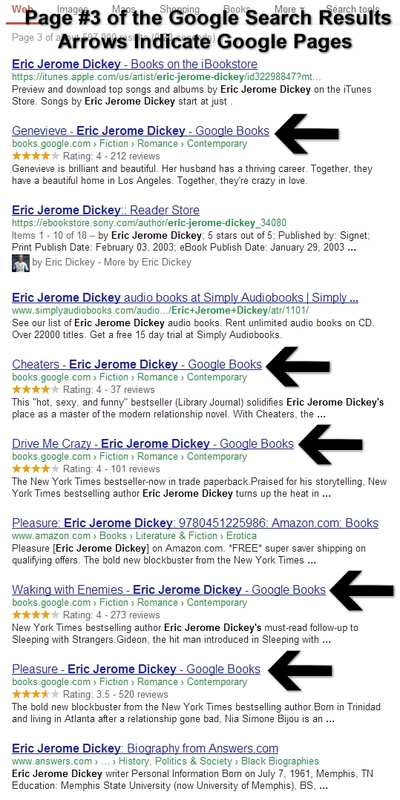 Of course a skilled internet searcher can be more successful at finding independent content but the vast majority of people, looking for information on Eric Jerome Dickey, but the vast majority of people looking for information on Eric Jerome Dickey will simply query his name as Google’s Adwords reveals (Note 5). The reality is that the typical person searching on the Web will run a very basic query, using Google and not look beyond the first page or two (Note 6). Few will consider how their search results are skewed. As a result, the average person has no idea what they are missing since the independent websites fail to show up in high enough in search results to ever be discovered. Hopefully, this article will raise awareness and help individuals recognize that they will need to probe more deeply to find compelling content; that was not created by a major corporation or deep-pocketed advertiser. Eric Jerome Dickey is just one example. But if you pick any prominent author, you will see similar results. Indeed, some results are worse, with Wikipedia or Facebook ranking higher than even the writer’s own official website. The cost and effort required to be discovered online is killing independent websites. Many websites have simply stopped producing new content or have shut down. Some have changed their content to focus to topics that appeals to a broader audience. This also explains why there is seems to be more celebrity scandal and sensational information online today. Some companies and organizations engage in search engine optimization (SEO), spend time utilizing social media, or invest more in Google advertising to help drive traffic to their websites. For independent websites where resources are limited, these efforts merely redirect money, time, and energy away from content creation.This redirection of resources end up contributing to the quantity and often the quality of what gets published, making the problem of acquiring visitors, ironically, more difficult. But something can be done. Before there were search engines people provided information about websites they liked by sharing the addresses of those websites with others. People would email one another and post links on their own websites to other websites. Today, there are all sorts of social media tools to help facilitate the exchange of information about websites. Don’t assume someone else will do it. Share links and encourage others to do so as well. Independent, mission-driven websites depend on visitor support. Articles such as this are not written to appeal to the masses. In other words, they are not written solely to make money. If I wanted to generate more revenue, I would have broken up the article to cover more pages (forcing more advertising banner impressions) and embedded more ads within the text. Honestly, I would have written about “Pregnant Kim Kardashian & and Kanye West Celebrate Valentine’s Day” or “Jesse Jackson Jr.’s Plea Deal.” I could have worked a book angle for both of these stories. If you’ve read this 2,500+ word article this far you are the intended audience. I hope this article has made you more sensitive to issues impacting the variety of information found on the Web and how it is accessed. I also hope you will be prompted to brainstorm and execute ideas to help support the independent websites of your choice. All of this comes from someone who uses Google, Amazon, Facebook and Wikipedia, extensively—every single day. I have been an Amazon affiliate for more than about 13 years selling books on their behalf in return for a commission. I have also been posting Google Ads on AALBC.com for the better part of a decade. Google ads are largely the reason AALBC.com is my livelihood, as I can use Google to compensate me for unsold advertising inventory. Recently I listed three other Google applications; Search, Analytics and YouTube, as 3 of the “7 Free Tools to Make Your Website Better.” Of all the social media platforms, I use Facebook the most. I spend about an hour a day sharing AALBC.com content with fans and followers. I contribute to and reference Wikipedia on a regular basis. The sad part about my most recent Wikipedia contributions is that they are motivated more by a desire to drive traffic to AALBC.com than a desire to enhance Wikipedia. Wikipedia drives a lot of traffic to AALBC.com. If you think I’m the only person using Wikipedia to generate traffic, just check out the External Links at the bottom of any Wikipedia page. Driving traffic and increasing awareness of AALBC.com is the only reason I use Facebook today. They call it “social media marketing” but that is a topic for another rant. I recognize, perhaps more than most, the value of all of the platforms mentioned here, but I am also witnessing how commercial pressures, greed really, is taking these valuable resources and turning them into monsters—diminishing the potential greatness the Web can achieve and destroying independent voice as the Web itself coalesces into a four headed hydra of Google, Wikipedia, Facebook and Amazon. Again share your ideas in the comments section. Needless to say don’t forget to share this article. P.S. A Google search on the word “pimp” returns the Wikipedia.org entry No. 1 in the search results. All website ranking notes are as reported by Alexa. Google searches were run using Google Chrome browser in incognito mode and while logged out of Google. Your results may differ. However Wikipedia should still rank high.